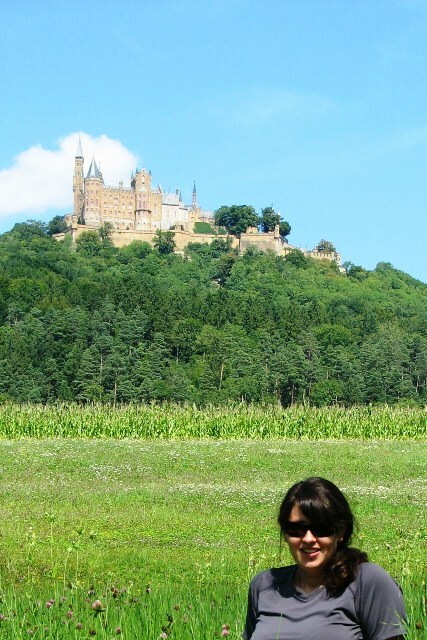 Hohenzollern Castle was the second castle I ever visited in Germany – talk about getting spoiled! It set a high precedent for all future castles that I would visit: Schloss Ludwigsburg, Heidelberg Castle, Munich Residenz and Schloss Lichtenstein just to name a few. View of Hohenzollern Castle. We did a 15km hike to it, but for a much easier option you can drive to the nearby parking lot. Hohenzollern Castle is only 70 km south of Stuttgart. If you ask any local about which castles you should visit in the area, invariably Hohenzollern will be suggested. It commands respect even from a distance nestled on top of Mount Hohenzollern. I can imagine that its presence would seem imposing to enemies in medieval times and be of comfort to allies. Perhaps that’s part of the reason Hohenzollern Castle served as a refuge for the Catholic citizens in the region during numerous wars, including the Thirty Years’ War. The courtyard of Hohenzollern Castle. You definitely won’t be alone, but I still really enjoyed visiting this castle. The current Hohenzollern Castle is actually the third version of the castle. Hohenzollern was originally built in the 11th century, but was destroyed during a 10 month siege. The second version of the castle was built between 1454 – 1461. But by the end of the 18th century it had lost its strategic importance and fell into ruin. 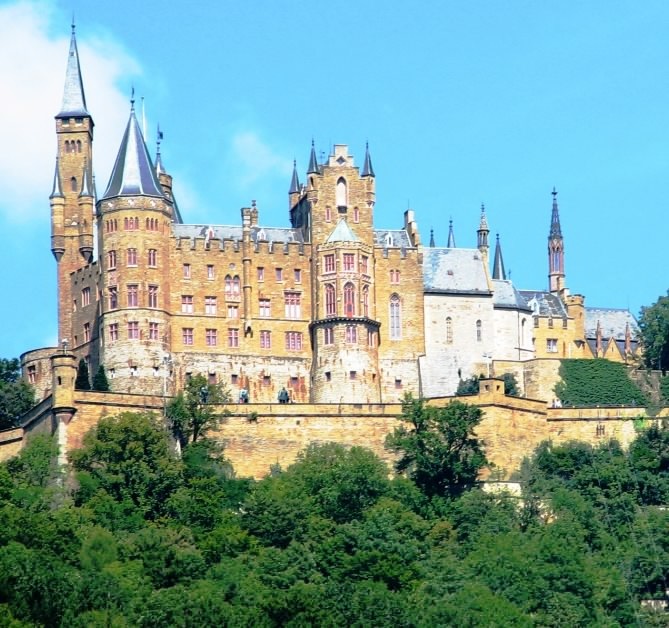 Finally, the third version of the castle, which is Hohenzollern Castle as we see it today was built between 1846 0 1867 in a Neo-Gothic style. One of the castle towers. One might think that would be enough for one castle to endure, but in 1978 Hohenzollern was badly damaged due to an earth quake. 20 people had to be dug out from the crumbling castle walls. Somehow I’m thinking that castles built over 150 years ago weren’t built to be earthquake resistance. In recent years Hohenzollern Castle has seen happier times receiving over 300,000 visitors each year. It is now one of Germany’s top visited castles. Pretty impressive when you consider there are over 25,000 castles in Germany. If you’re looking for something quieter, check out my favorite castle ruins in Germany. Hohenzollern also serves as a summer camp for needy children. I wish I could have gone to summer camp in a castle. English tours are available of Hohenzollern Castle on weekends and public holidays at 11:30, 2:00 and 4:30, which I really enjoyed and would recommend. Beautiful! We loved our recent wine-tasting river cruise of Germany where we cruised down the Rhine River, seeing castle after castle. We toured several castles and it was a wonderful experience, but we would also love to tour this one!! @Jann - Oh I haven't done the wine-tasting river cruise yet, but it's very high on my list. I've heard it's fantastic. With 25,000 castles, there's so many to see in Germany. the 15Km hike sounds right up my alley- this would be a great way to view the castle! Hohenzollern is the kind of castle (the fairy tale kind) that I've never seen in person. What an interesting history. So nice that it's used as a summer camp for needy children. I like that. @Jade - Seeing Hohenzollern in the distance was great motivation to keep on going :) @Cathy - You're right, it really is a fairy tale castle. I love that it's used as a summer camp as well. @Debbie - It's kinda in the middle of nowhere, but I really think it's worth the trip. They also have special events in the summer which look interesting. In July we're going to a Shakespeare play held in the courtyard of the castle. summer camp in a castle does seem pretty awesome! how close does the current castle mirror the original one? did they change the design each time, or just do restoration work? Very Cool! I love German castles. I think my wife gets kind of tired how enamered I am with castles but they are so cool. Before coming to Europe the oldest building I have ever seen was sometime like 120 years old. You see history everywhere in Germany. Great post. Another thing to my todo list. @Jamie - I know, summer camp in a castle sounds like so much fun. Good question about how close the current castle is to the original one. I believe it's quite different and that the current one is much bigger and sturdier than the original one and built in a different style. It sounds like rather significant changes were made. Once again, I realize I don't know anything about Germany except modern history and a few Scorpion songs :lol: See, I had no idea there were that many castles in Germany, I always thought it was a French thing. Looks like people around Europe liked their houses big! @Keith - I would love to see the market there. They're performing a Shakespeare play in English in July in the courtyard if you're interested. I think the setting would be fantastic. @Zhu - It's funny because I don't know nearly as much about France as I should and haven't even been to a castle yet in France (it's on my list). Yes, I guess Europeans did like their houses big - even if they kept destroying them in wars. Wow, the Germans REALLY know how to do castles don't they? Germany has such a wealth of castles but this is particularly spectacular and must be a welcome sight after a 15km hike! @Sharlie - Yep, I like to do things the hard way :). Great hike with a great reward at the end! @Milena - I've been to quite a few, but still have a loooooooooong way to go as well :). A good problem to have! Hi,I read your new stuff named "Hohenzollern Castle - Monkeys and Mountains | Adventure Travel Blog" on a regular basis.Your humoristic style is awesome, keep up the good work!